Ocho Tulum is a small, intimate hotel in the Riviera Maya. 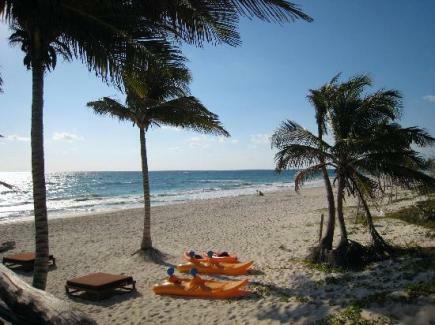 It is located in Tulum with beautiful white sand beaches. This eco friendly hotel with 18 quaint cabanas was built from local materials and has a very simple feel to it. It uses wind turbines and solar renewable energies to supply electricity. You will grow fond of this hotel as you get to know the husband and wife owners, John & Belen who run the resort. This charming, simple resort offers an intimate atmosphere in the heart of the Riviera Maya. Here is a picture of the beach at this beach hotel. This small hotel offers kayaks and kiteboarding lessons. There are two yoga classes offered each day as well to rejuvinate and renew you. Each morning a free continenetal breakfast is provided! There is a restaurant called Petit Mexican cuisine. It offers a blend of mexican flavors and aromas from different regions. The restaurant is fairly priced and delicious. 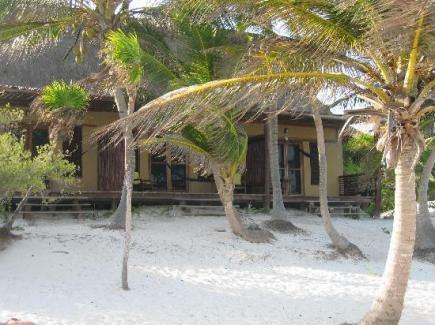 Beachfront, full oceanview, partial oceanview and garden view. patio with sitting area and hammock. This picture is of a beachfront bungalow at this hotel. Steps from the beach!